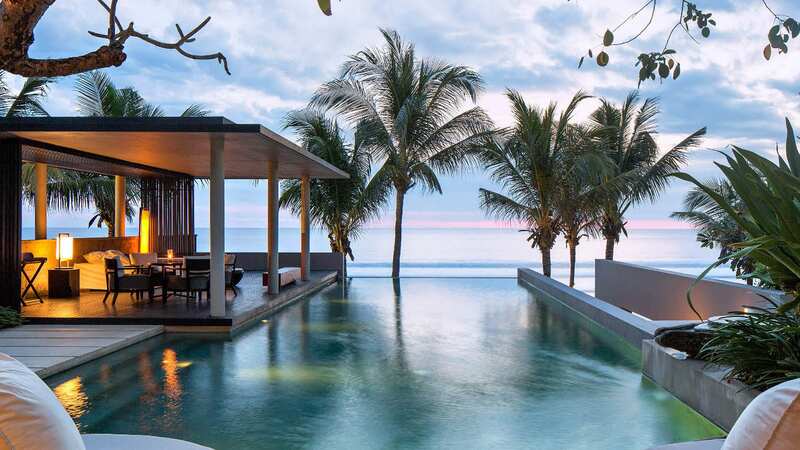 Villa Vedas is an innovative, utterly unique 5-bedroom luxury beachfront hideaway set on a pristine beach just north of Tanah Lot temple on Bali’s southwest coast. 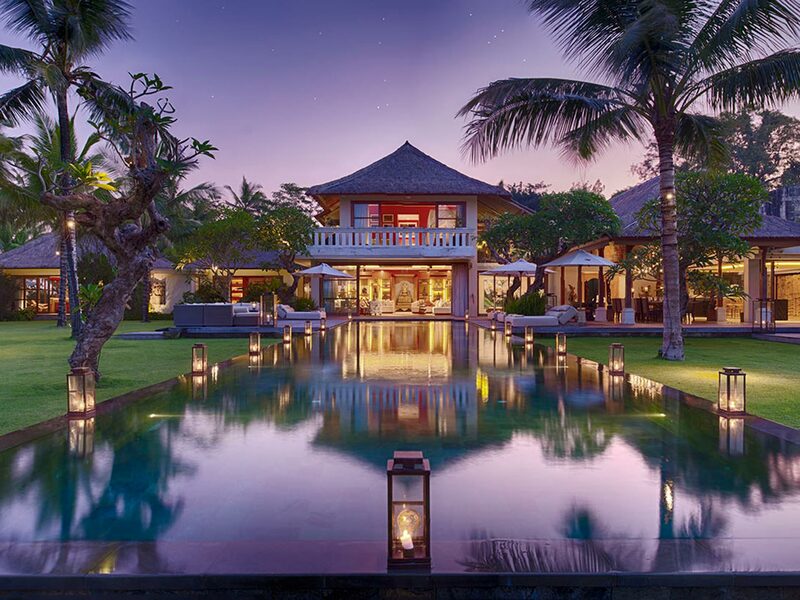 The setting here is simply sublime, and the villa was meticulously designed to provide unhindered views from every spacious room in the villa, and from the lush tropical gardens and three swimming pools. Guests are also treated to cutting edge technology like the unique Häfele glass sliding wall system, Wi-Fi throughout, and music, lights and a central air-conditioning system that can be controlled via your smartphone. For those who aren’t tech savvy, no need to worry because there is a team of professional staff on hand to provide 24-hour butler service any time you need it. No matter which direction you turn at Villa Vedas, you are rewarded with incredible vistas. To the west you have 45 metres of untouched beachfront and ocean along Bali’s famous sunset coast; to the east the peak of Mount Batukaru volcano rises above the jungle; and to the north and south there are lush green rice paddies spreading out before you. 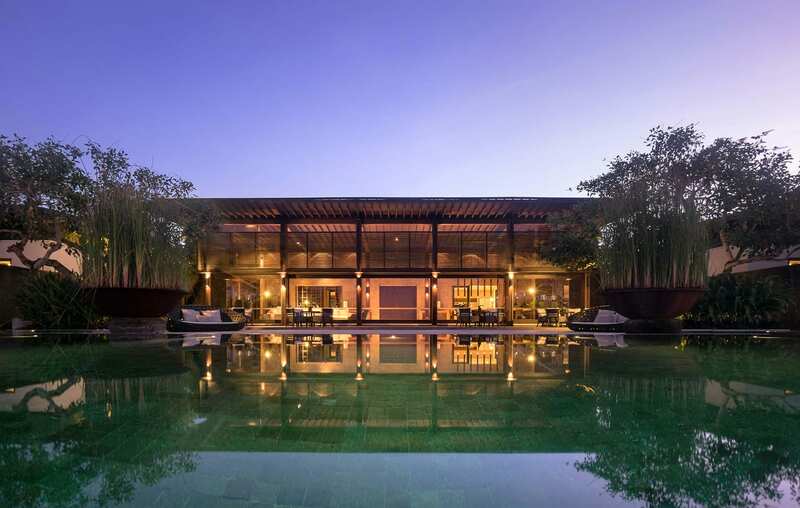 The villa itself is a work of art with unique features like floating staircases, three pools including a glass-bottom sky pool, and five stunning bedrooms with huge glass walls that allow you to soak up all of that unforgettable scenery. 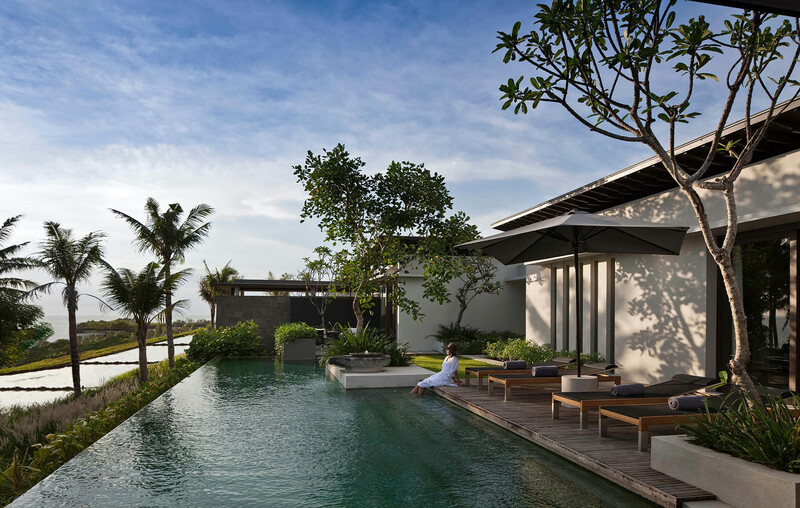 If it’s spectacular architecture, stunning nature, and modern conveniences you’re after, then Villa Vedas is your perfect Bali holiday escape. *Minimum stay 2 nights during Sunday to Thursday nights inclusive during stay dates between 1 April and 15 December 2019 and 2020. **Minimum stay 3 nights during if a Friday and/or Saturday night is included during stay dates between 1 April to 15 December 2019 and 2020. 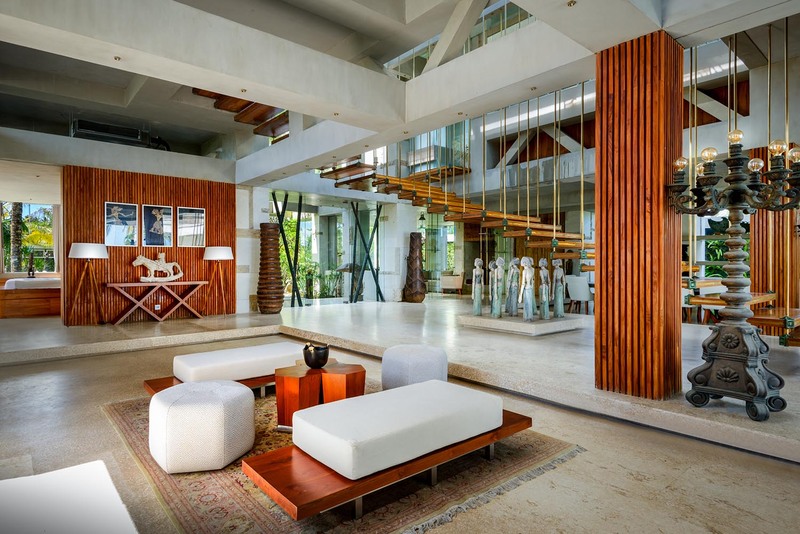 The architecture at Villa Vedas is one-of-a-kind with many of the features built by hand on site. 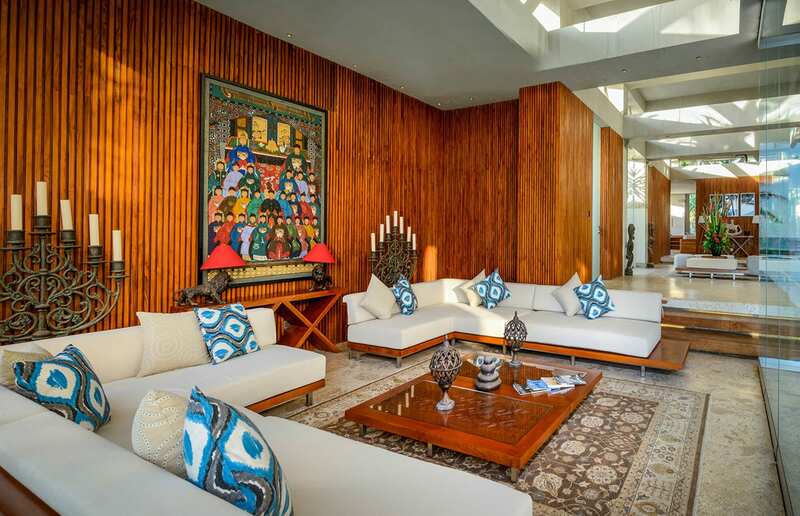 On the ground floor you have a large living area with plush sofas, oriental rugs and tasteful wood and stone carvings. 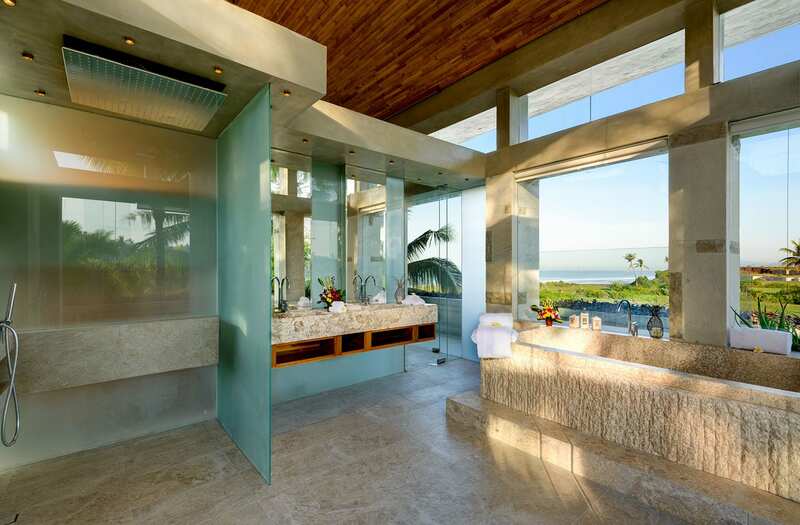 This room has Häfele glass sliding walls that can be opened to let in breezes off the ocean or closed to provide a cool air-conditioned space. 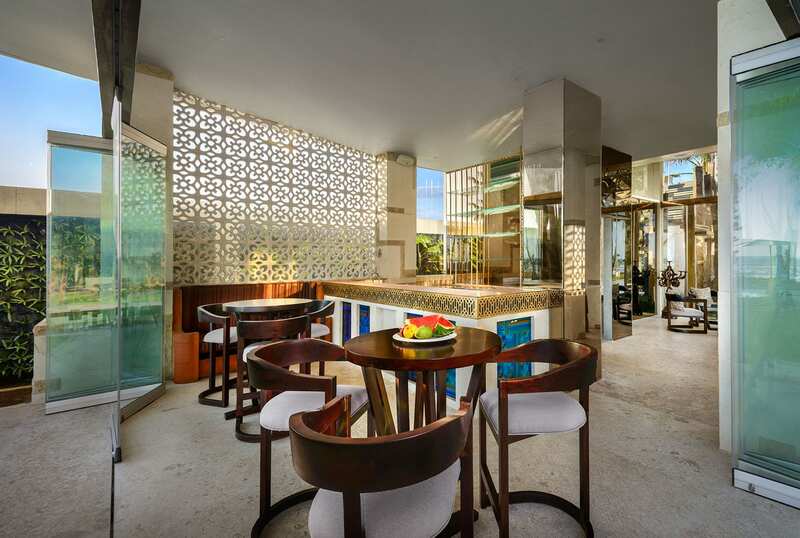 Then you have contemporary dining spaces, an art gallery, a media room with huge cream sofas and a 60-inch TV, and a stylish bar with a custom-designed brass countertop and plenty of seating overlooking the 40-metre pool. 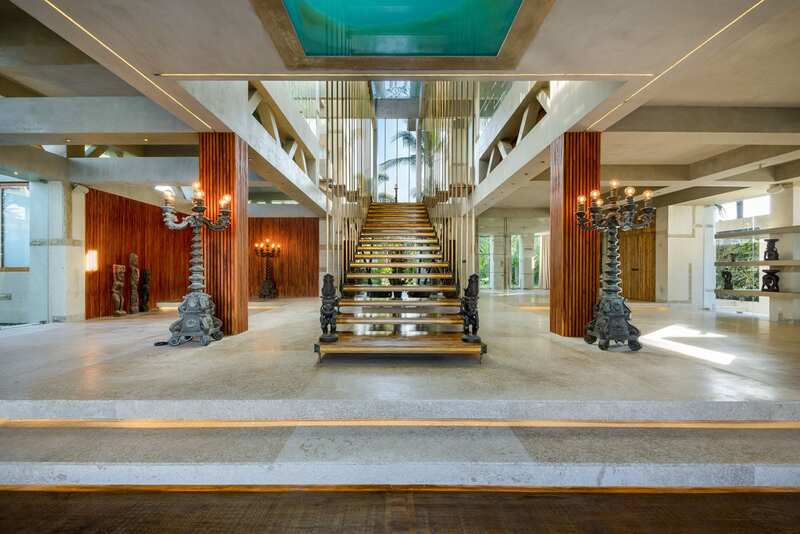 To reach the upper level of the villa there are two stunning floating staircases, one made with hand-carved teak steps supported by brass beams, and another with steps supported by natural crystal rock pillars. 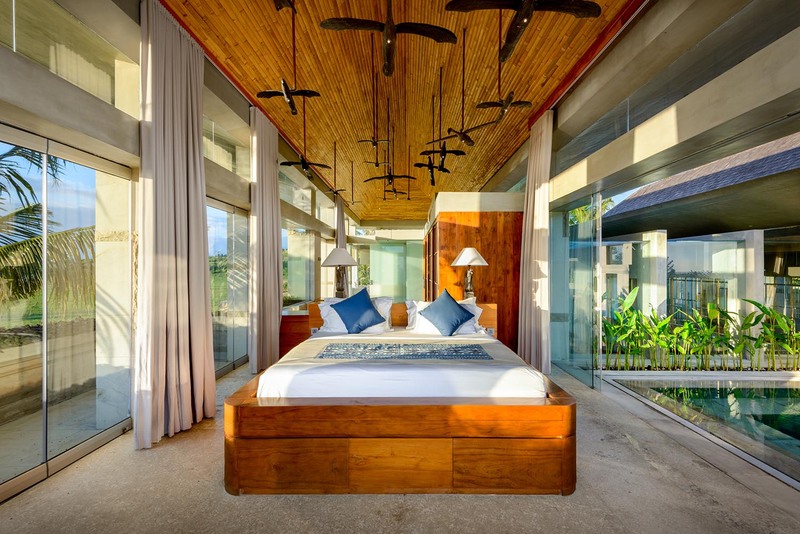 The master suite at Villa Vedas is a destination all in itself, as this huge room has a soaring bamboo ceiling and vast windows that allow for 270-degree views over the ocean and gardens. 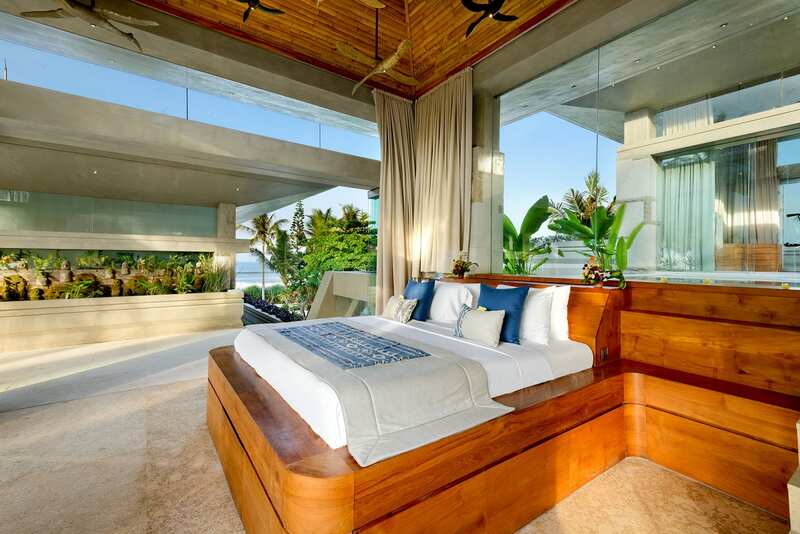 The built-in bed is cantilevered from the wall, so it seems to hover the smooth stone floors, and it looks out to an entire open wall that frames the horizon over the ocean. The luxurious ensuite bathroom has a large bathtub carved out of a solid slab of marble, twin basins set in a marble countertop, and a rainwater shower. Each of the five bedrooms at Villa Vedas is similar in size—that is to say, very large with ample storage space and huge ensuite bathrooms. Two of the guest bedrooms are on the upper floor on either side of the sky pool, and two guest bedrooms sit on the ground floor. All of the bedrooms boast king-sized beds, views of either the ocean, garden, or rice paddies through huge windows, and beautiful bathrooms with marble bathtubs and rain showers. 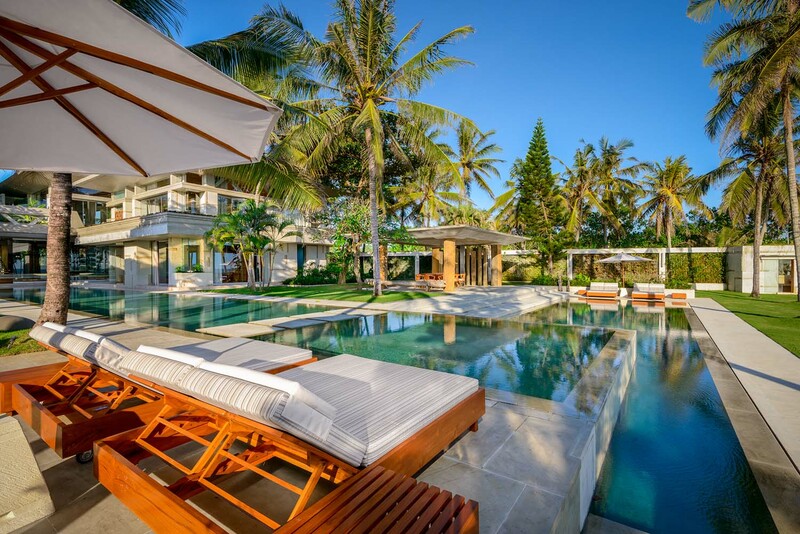 Villa Vedas’ prime location next to the ocean makes it the perfect place to enjoy Bali’s beautiful tropical weather. 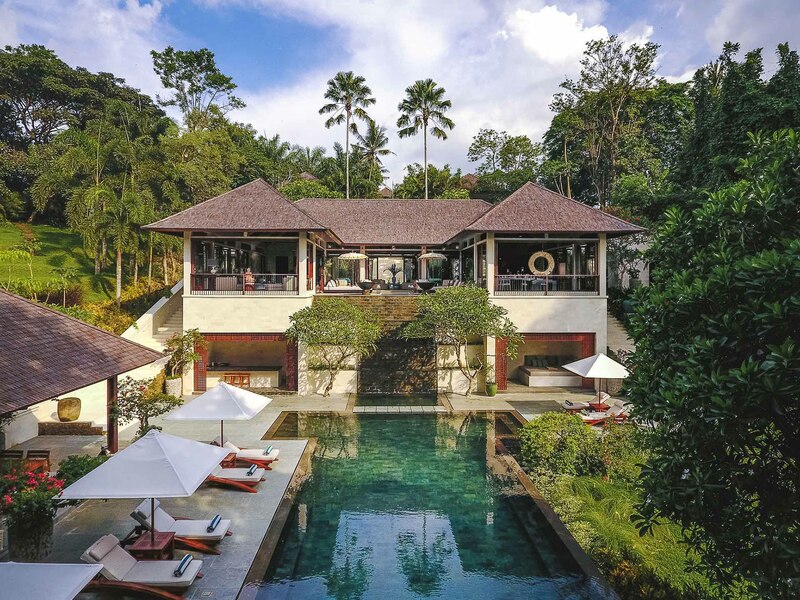 From the main building you can follow stone paths through the manicured lawns shaded by coconut trees, or head directly to the 40-metre and 20-metre swimming pools that spread out in front of the villa. 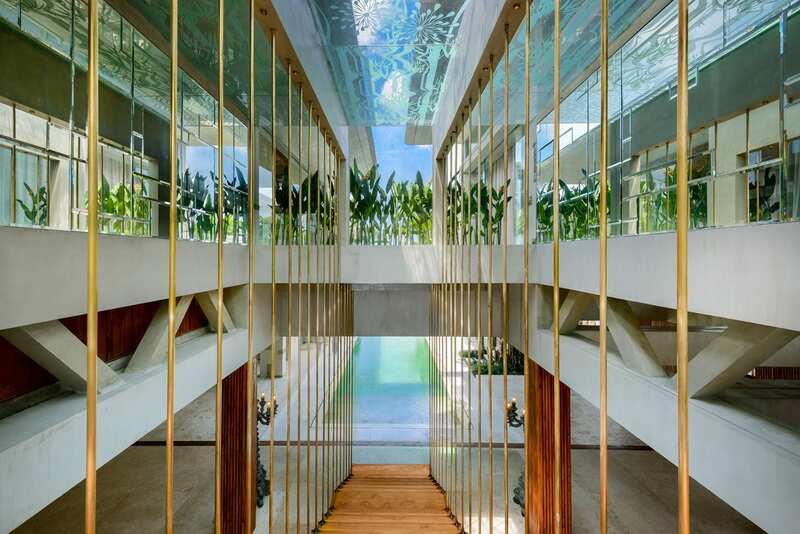 There is also a 6-metre sky pool on the upper floor of the villa that sits between the two upper guest rooms and has a glass bottom with nano film technology that can turn the glass from clear to opaque at the flick of a switch. The villa also has a breezy bale next to the ocean with BBQ facilities and a USB connection for DJs to connect to the indoor/outdoor sound system. CAPACITY 10 Guests (5 double bedrooms, all with solid stone baths carved from a solid piece of marble and enormous rain showers). 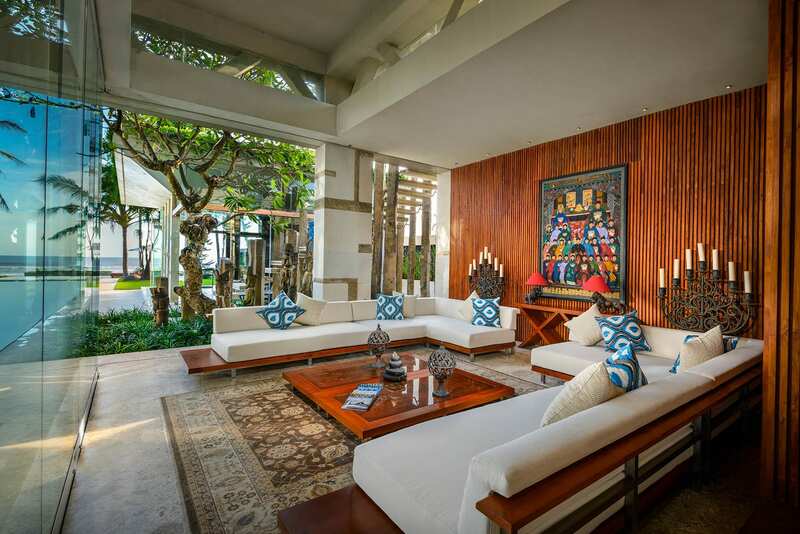 LIVING AREAS Large living area, dining areas, bar, art gallery, media room, ocean front bale offering alfresco dining overlooking the Indian Ocean. The gardens feature a dramatic gazebo area facing the beach with BBQ facilities including gas, water, and USB connection for DJs into the extensive indoor and outdoor sound system. ENTERTAINMENT Satellite TV, sound system, pool table, for guests with a taste for the latest technology, lighting, music and air-conditioning can all be controlled through your smartphone. CHILDREN Baby Cot & High Chair available. TRANSPORT Car and driver at a special rate of USD 50++/day for 8 hours (excluding petrol). Two scooters and two bicycles available for guest use. WEDDINGS & EVENTS Offering a spectacular venue for weddings and events, Villa Vedas can seat up to 150 guests throughout the extensive gardens and on the stretch of grass on the beach in front of the villa. ADDITIONAL Safety deposit boxes, barbecue, Finns Club Platinum membership (gym, tennis, bowling, discounted golf, splash park), 30 kva genset for backup power. Villas Vedas is located approximately 1 kilometre to the north of Tanah Lot, and offers panoramic views of the Indian Ocean to the west, ancient rice paddies to the south and grazing pasture to the north, and Gunung Batukaru (Batukaru Volcano) in the east, featuring 45 metres of absolute beach frontage and private beach access. 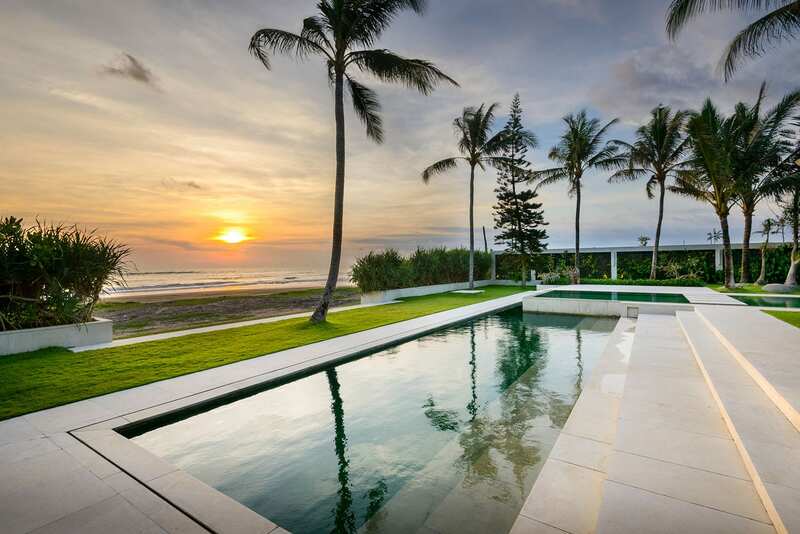 The villa is a leisurely 45 minute drive from the nightlife and restaurants of Seminyak.